good one mark, i would have never noticed it. but it surely will be my next attraction at sultan center. 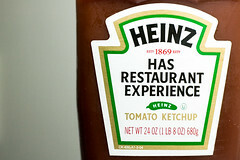 it's part of the competition that Heinz did a while back. and each if the messages is submitted by a Heinz user. Back then I thought it was a great marketing campaign but now I believe it's genius. Interesting. Ever been to Taco Bell? They have essentially the same thing on all their little taco sauce sachets.